Hi, there. I think I’m in the right place. See, this is my first time here. 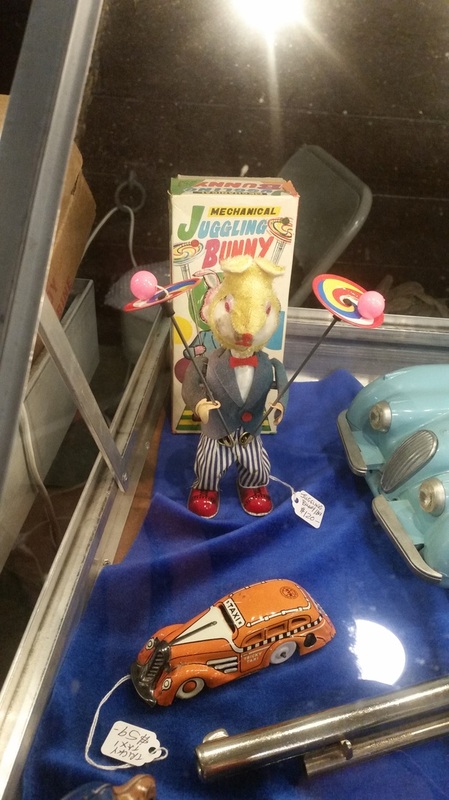 I’m Liz McCall, and I manage Well Played, a vintage toyshop in East Aurora, New York. The shop was actually my dad’s dream of a lifetime. When he retired from the police force, he sank most of his pension into the storefront on Main Street. He and I moved into the small apartment over the shop, and soon started filling the retail space with toys from all decades, all carefully cleaned and restored. One would think that a toy shop would be a draw for children, and I guess most of the kids who come in like us just fine. But it’s really the adults drawn to the shop. Some collectors, yes, and even a few interior decorators, if you can imagine that. But for most of our customers, nostalgia lures them in…and brings them back. It’s hard to walk down any aisle and not see something that immediately takes you back to those— hopefully happy—days of childhood. Maybe it’s that doll with the eyes that opened and closed, that you carefully tucked into its bassinet at night. Or a cap pistol that you were sure would allow you to catch all those desperados roaming around the neighborhood. 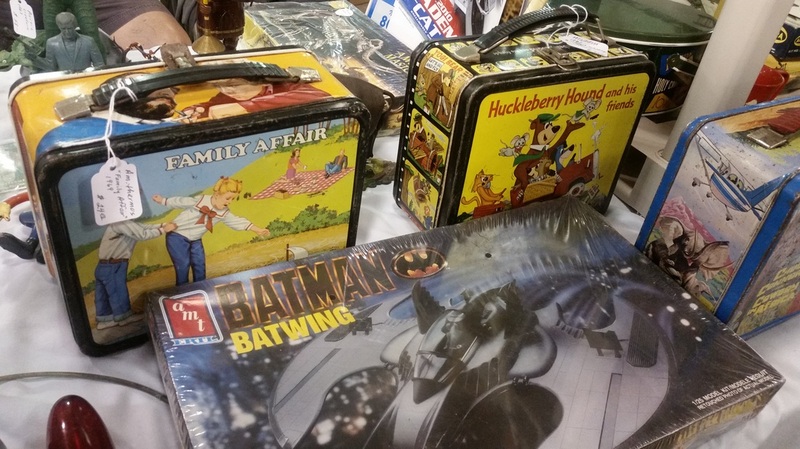 Or even the Scooby Doo lunchbox into which your mom would pack a PB & J, an apple, and a Thermos of milk. Note from the author: The reason Liz is new here is that this is the first Killer Character post for the upcoming Vintage Toyshop mystery series. 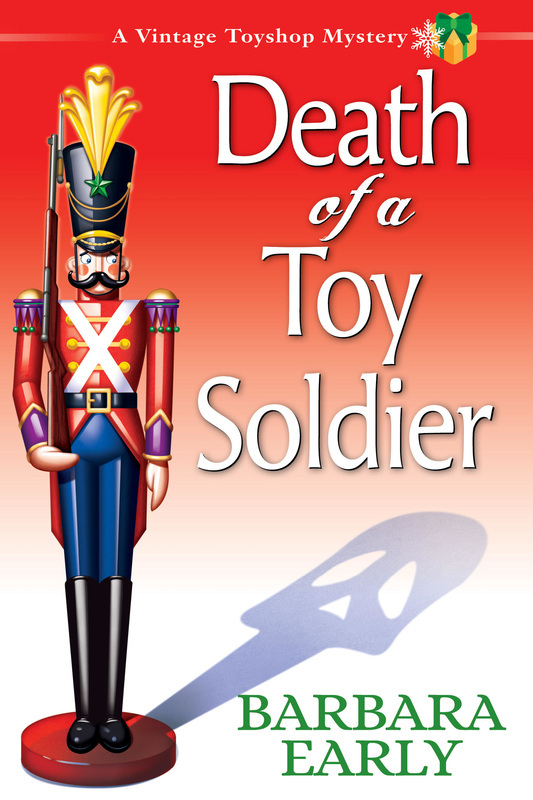 The first book, Death of a Toy Soldier, releases October 11th from Crooked Lane and is available for pre-order from Amazon, Barnes and Noble, BooksaMillion, Book Depository, and elsewhere. Please follow Barbara Early’s Facebook page for more information and future giveaways! 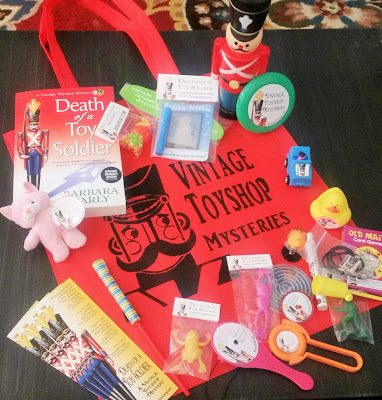 TODAY’S GIVE AWAY is the pictured VINTAGE TOYSHOP Super Swag Pack PLUS a somewhat rare advance review copy of DEATH OF A TOY SOLDIER. To enter, leave a comment below, including your email address in a safe, spam-free format (ie. cozyreader AT myhost DOT com). International entries permitted. One entry per person. Occasionally blogger hiccups and loses comments. If you have trouble posting a comment, alternately you may enter here. Winner will be chosen at random and notified via the email provided. Question for discussion: Do you have a favorite toy you remember from your childhood? Yes, you can enter. Thanks for doing so! Jacks. Did anyone else play with these? We spend hours sitting outside playing with them. I liked them, but I was awful at it. So good for developing coordination, though. Would you settle for an anti-favorite? At some point, back in the Howdy Doody days, my parents decided I loved marionnettes. Nope, I thought they were creepy, but I was given at least three, and a puppet theater for them. I did have a great green dragon hand puppet, though. Sounds like your parents liked marionettes. And yeah, they can be a little creepy. I had a game I loved for some reason where you set up a town to deliver milk and eggs. Milk and eggs are important to kids. Important to me too. I haven't had breakfast yet! The books sound like fun. I've still got a couple of my dolls. My daughter played with them and I'm hoping to have a granddaughter someday to pass them to. Remember to leave your email address, Debbie! I miss all of my original My Little Ponies, Rainbow Bright, and Care Bears. The new one just aren't as good. My husband once traveled to Baltimore on a business trip at the tail end (pun unintended) of a Brony Con. Nothing like walking into a hotel lobby and running into, without warning, a large group of cosplayers! Until that point, I wasn't aware of the tremendous adult following for MLP. Liz, you are a hoot! Don't enter me in this contest of yours, but I just wanted to stop by and say hello. Tell your father hey for me and if he finds any monopoly games from the original series to give me a call. I have a few favorites Barbie, of course, also Colorforms. I bet only us older readers remember them. I also loved my hula hoop. This sounds like a great series. I would love to win a copy of the book. Thanks. Colorforms were so much fun. I still remember how the box used to smell when you opened them for the first time. Probably deadly chemicals. LOL. How did we survive? I was a traditional girlie girl, so looking back I would have to say my baby doll was my favorite toy. I still have my little wind-up "music box" that looks like a radio and plays 10 Little Indians. Oh, I remember that song. I'm going to lay odds kids don't sing that anymore. Kind of like how Agatha Christie's "And Then There Were None" evolved from the original title--and then the second. WOW! I love this toy shop series already. I also loved the Betsy McCall paper dolls. I had a ragged Pixie (or was it Dixie) stuffed mouse until it fell apart, probably a hand-me-down. Still LOVE cartoons. And my sister and I collect Snoopy items. Another sister of mine had a lunch box with Dale Evans, and passed down her wagon/team and plastic Indians set to the rest of us. Well played, indeed! I'm still looking for Betsy McCall paper dolls every time I go to a toy show. Haven't found any yet. I have my Betty Wetsy doll from 1956. She still wets ! Lol. I also still have my farm , it's a wooden barn with a cow , pig , horse , chickena lamb and the farmer with his tractor. I didn't have a Bozo doll, but I had the old Bozo punching bag. Always felt a little guilty hitting him, even though he always popped up smiling. I can't wait to read this series! Thank you for the fun giveaway. I would love something like this. I have gone back and started collecting Nancy Drew books and anything connected with her would be my squeal as I walked down the aisle. What a charming subject for a mystery. Please enter me. I came across a set of Nancy Drew paper dolls at a toy show once--and I so regret not buying them. My favorite toys were the Breyer plastic horses. Whenever I was given a Barbie type doll, I would put it in a "house" and the horses would have grand ranch adventures. That sounds like something that should be in a Toy Store movie. Seriously. I can see poor Barbie locked in the house and the horses having a grand time. Thanks for sharing that! What a great collection for a giveaway! I'd love to win this. They often do have old books at the toy shows I go to. Last time I found a vintage Tom Swifty. And I love Little Golden Books. Oddly enough, I had marbles but never played with them. I LOVED, however to look at how the colors were swirled in the glass. Yes. Weird kid. Spent hours staring at marbles. I'd love to go back to being a child again by visiting a toy shop. Thanks for the giveaway. I loved my building blocks and teddy bear. I still have the bear! I so love vintage toys. I remember some of the tin toys with which I used to play. I still have the tin windup bird that a relative gave me one Christmas. I know I will enjoy this book also. Thanks for the chance to win. Tin toys feature in the plot of the first book. So fun! I think I will be one of your customers. I had forgotten all about Betsy McCall. I loved those paper dolls. My grandmother was amazing. She would draw the doll and doll clothes on a paper grocery sack for me to color and cut out. Great giveaway! Thanks for the chance to win. It's fun to see these things and remember! Sounds like a fun new series. I always loved my dolls - Barbie to Thumbelina. I am really looking forward to this series! My favorite toy growing up was my Barbie doll. One of my grandmothers used scrap fabric and made a ton of clothes for the Barbies. My sister and I played with them for hours! cking78503(at)aol(dot)com. Oh this sounds so good. Thanks for a chance to win. Just seeing your toys brought back so many happy memories of my childhood, I would love to share these toys with my children. My mom always tells me about when she had her tonsils out and my grandparents bought her a Chatty Cathy doll. I am looking forward to reading this book! Thank you for having a wonderful store and a fun contest! I still have a little boy doll I called Butch. it will be fun. Sounds like a great book. Such a fun giveaway and I can't wait to read the book! Thanks for the chance to win! A Toni Doll - Toni for the home permanent company. She had black hair and you curled her hair by using a mixture of sugar and water. I wonder if right after the curly hair the house would have been filled with ants. Then I lived in Indiana and in December ants were nestled snugly in their beds or frozen solid. What a marvelous themed series... I wish I had the forethought to save some of my toys...Barbie, Hot Wheel cars, puppets, and Trolls. They were all so special. My daughter was such a Life fan. We played so many times when she was little. I think it instilled in her the desire to go to college! I'm tearing up reading that story. That was one loved Barbie. Wow. I wish someone invented time travel. I would have showed up on your doorstep with a pile of toys. Since I can't I'm going to have to look into seeing if there's a program to get toys specifically to kids in the system. You are quite the collector! 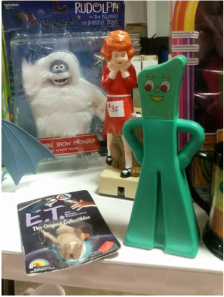 I actually took the picture at a vintage toy show I attended. (I like to look, but I really don't have space for another collection) They had the Charlie's Angels dolls too, mint in box. Something to see! What fun. A story about toys! This series looks great! Can't wait for it to come out! One of my ffavorite childhood toys is Piggy. I was at the dollar store with my sister and our cousins. There was a stuffed magenta pig with a bright yellow bow tie. My cousin bought him for me. I still have him. Thanks for the chance to win!!!! That sounds fun! And it proves toys don't have to be expensive or complicated to be cherished. My daughter loves to collect marbles. We love going into vintage shops and finding a few treasures to add to her collection. I remember very fondly all of our Fisher Price Little people toys. There were so many different ones. BTW, I love the name of the toy shop in the new book. Thanks! Fisher Price had--and still has, actually--a factory in East Aurora, the real town where I set the series! I had a fondness for Fisher Price when I was little, too. Wish I still had them all! I liked playing with paper dolls. I loved Trixie Belden books. I had a pink and white Schwinn bike. Those were probably my favorites. Schwinn bikes! Mine was blue with a banana seat--who remembers those? I have not read this series but want to!!!!!!!! My favorite and most treasured play things were my Madame Alexander dolls. My grandmother even made them clothes. I still have some. Istill have some of my.dolls and my Humpty Dumpty I slept with I still have my first stuffed animals I got as a baby! I would love to read this series, new to this author!!! Would really like to win this!!! Love old toys! I love the name of the vintage toy store! Congratulations on the first of your new series. I love old toys, wish I'd save some of mine. Thank you for a chance at winning such an awesome prize package! Thanks! Murder Well Played was actually the working title of the book when I was writing it. I was glad we were able to work it in some way. Thank you for the giveaway opportunity! This looks like a great read! Jillian.lauder (at) yahoo (dot) com. My mother had a garage sale and told me that I could buy myself a piano (practice pianos, back then in 1969, were around $150-300) if I sold my toys. Those toys sold FAST. A pretend car dashboard called the Playmobile, a set of Flintstones building blocks made of Styrofoam that were so big that you could build things to get inside of, Raggedy Ann and many other dolls (but not my Pebbles Flintstone that my grandma gave me or my Tammy dolls from Ideal with their wardrobe! ), air hockey set, Gumby . . . lots of stuff. Now it would be worth hundreds, ha! Enter me in the giveaway. Shalanna Collins. shalanna DOT Collins AT gmail DOT com. Hundreds at least. Garage sales seem like such good ideas at the time. I see some of the prices at the show and remember I had the exact same thing. But condition counts, too. The most expensive are mint in box.They go down pretty quickly when they've been played with. But that's what they're for. I love toy shops! !I still have my old music box that plays raindrops are falling on my heard!!! Its older than me!! Would love to win this, my daughter still has so me of my old toys, she has them safe in a container!!! I liked building toys like Legos and erector sets. My dad got me my own hammer so he could find his. I can remember some of the toys we had as kids, we had a lot of board games and comic books and Nancy Drew books. My sister had a lot of cowboy stuff. Wish we had some of those old toys today. Books sounds like a trip down memory lane. Can't wait to read. I had a teddy bear that felt as big as me at four. I loved that teddy and he hung out with me. He was black and white and I called him Brownie after my Grandpa. He disappeared when my mom was eight. They found his car on the route to work but never him.They thought foul play. I was so taken with the story. I named my bear after him. I still have him. What fun! 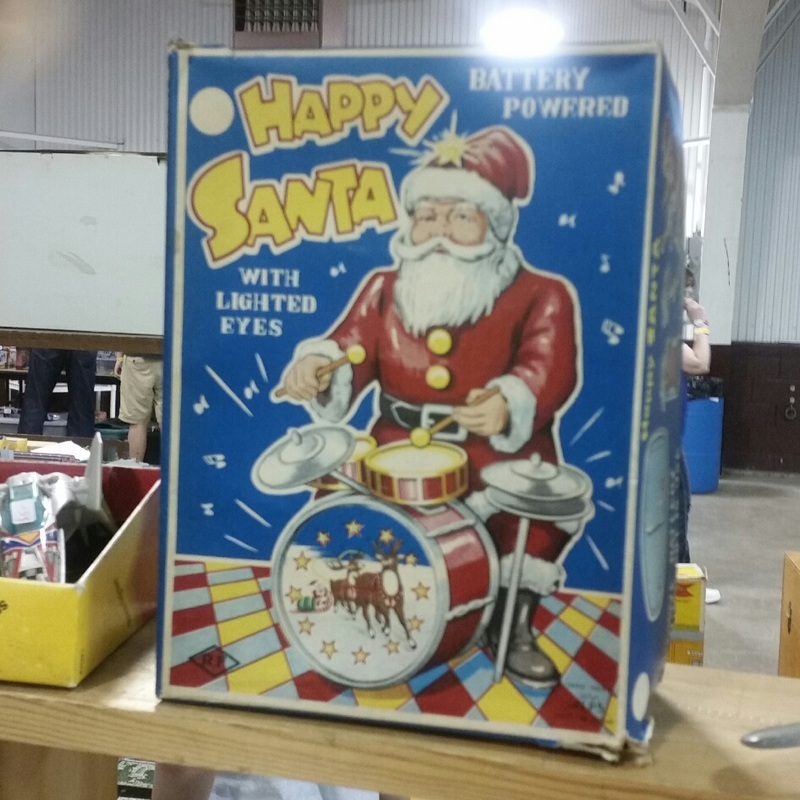 I love vintage toys...and non vintage too! I can't wait to visit your shop. I had a china faced doll that I loved. Unfortunately after too much loving the face got a crack in it. Her name was Petronella. The one Christmas toy I remember most is a small guitar I got when I was 10. I still have it. Thanks for the giveaway opportunity. Brings back fond memories of past toys!!! Loved my Chatty Cathy doll and Tressy...you pushed a button in her stomach and her hair grew!! I'm looking forward to reading the Vintage Toyshop mystery series. I loved paper dolls, Tinkertoys, and Legos. I have my first doll, still I wanted a Barbie and got Midge instead (I think my Mom liked the doll because she had red hair like her.A proper ginger. I love vintage toys and wish my mom had kept more of my stuff from the 60's and 70's. I do have a few lunchboxes. a Blondie, a Mickey Mouse and a Hot Wheels that was my brother's. Nice post. The series looks like a great, and fun read. Looking forward to it. And it is a lovely giveaway.